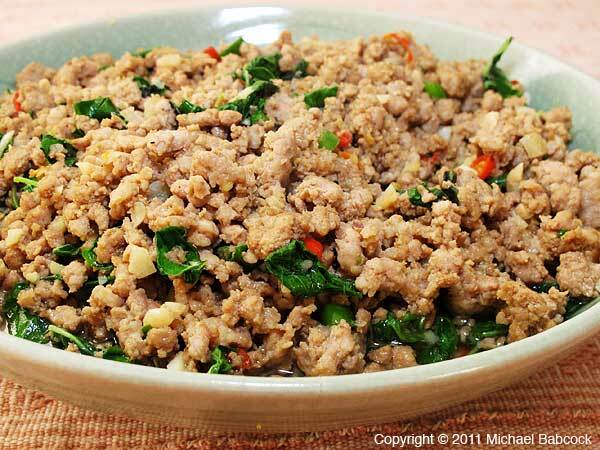 Of all the versions of the Thai dish Pad Kaprao (something stir-fried with Basil), my favorite is Basil Pork – Moo Pad Kaprao. It’s one of the dishes I cook the most for myself (and Kasma) at home. 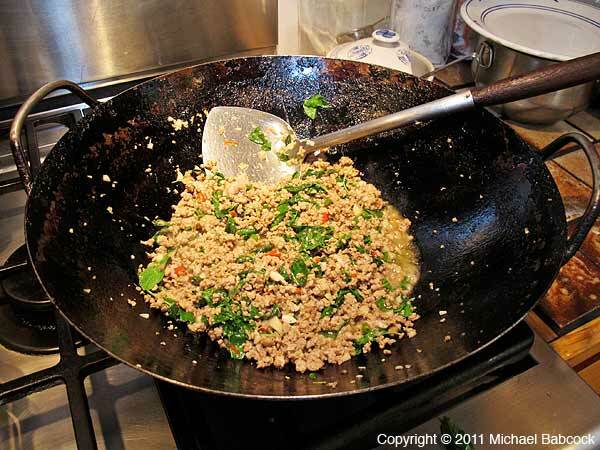 People often think of Thai food as being a lot of work: well, this dish is relatively easy, especially considering how very delicious it is. 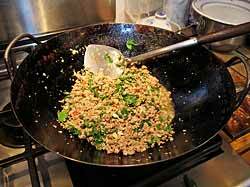 As mentioned in my blog on Basil Salmon, almost anything can be pad kaprao – stir-fried (pad) with holy basil (kaprao). You can make it with shrimp, chicken, fish, duck, squid – almost anything you can think of. 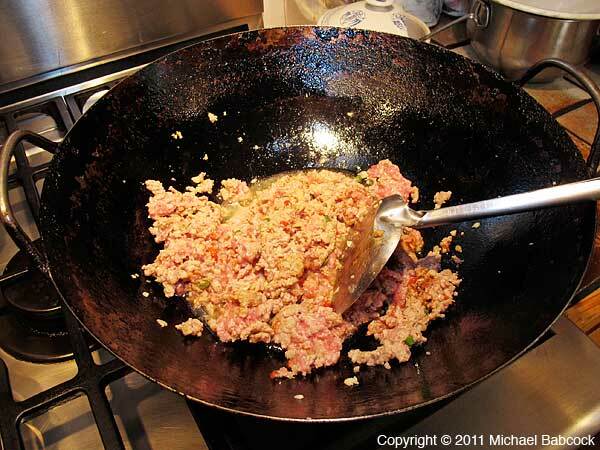 Ground pork seems to blend particularly well with the ingredients of the dish – the holy basil, fish sauce, garlic, black soy sauce and chillies. 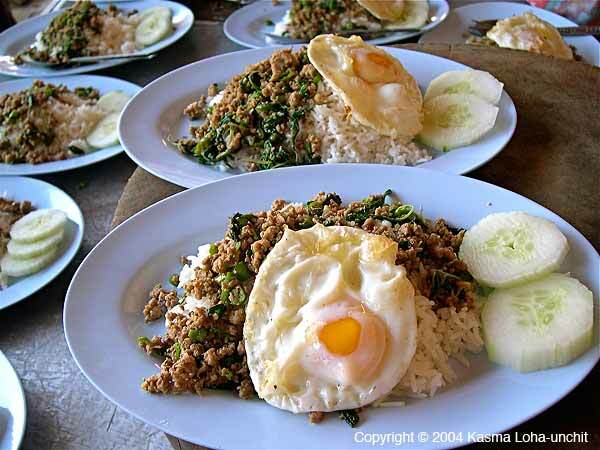 Often in Thailand you find this as a one-dish meal basil pork served with a Thai-style fried egg (fried in lots of oil until it’s crispy on the edges) served directly over rice. The way I cook the dish is a variaton on Kasma’s Spicy Basil Chicken (Gai Pad Kaprao) recipe. Her recipe calls for three ingredients that I leave out: shallots, kaffir lime leaves (optional) and white pepper, though I’ll sometimes put in the pepper. Heat oil (I prefer lard) in a wok until it smokes. 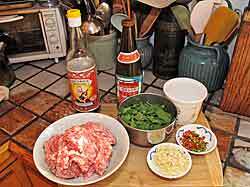 You can check Kasma’s Basil Chicken recipe to get an idea of quantities. This is one dish that I like very, very hot. She calls for 12-20 Thai chillies (prik kee noo) in thin rounds for a pound of meat: I’ll add up to 25 so that the dish will sizzle in the mouth. I’ll also add more holy basil leaves – I don’t always measure, I usually add an entire bunch. It’s hard to imagine this dish with too much holy basil. I suggest you give it a try. For me, it’s one of those dishes that I get to craving and just havo to make. Do serve over rice – they really compliment each other. 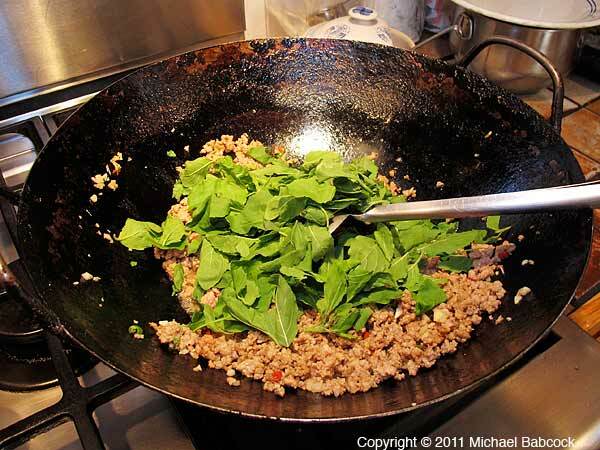 And do make sure you use holy basil rather than Thai basil – it makes a big difference n this dish. Check out Kasma’s Thai recipes for more delicious dishes. Written by Michael Babcock, January 2012. 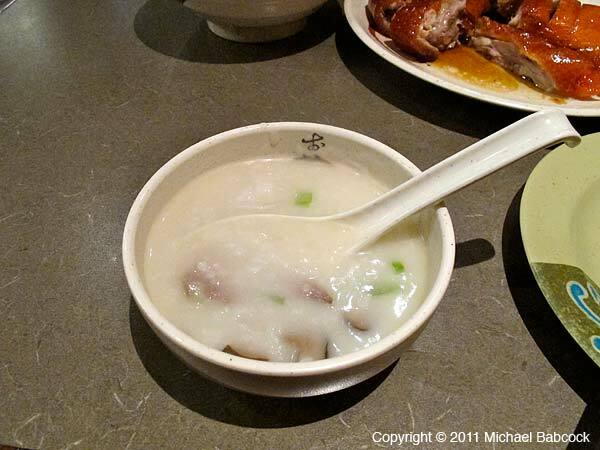 Gum Kuo restaurant, in Oakland, California’s Chinatown, is a great place to go for congee (rice porridge) – johk (or jook or, sometimes, juk). It’s the restaurant where we go for breakfast whenever we make a visit to the Old Oakland Farmer’s Market. We’ll visit there on other occasions as well. 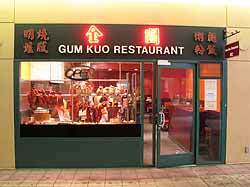 Gum Kuo is found at 388 9th St. (between Webster St. & Franklin St.) in Oakland, California. Their phone number is (510) 268-1288. It’s located in the Asian Cultural center and is found in the entryway to the center’s courtyard right off of Franklin Street. There’s a parking garage directly adjacent to the center, which is good, given how difficult it can be to find street parking in Chinatown. 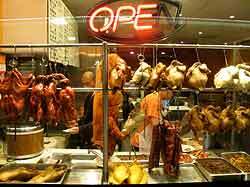 When you walk pas the restaurant, you’ll see familiar Chinatown sight – browned, succulent-looking roast ducks and a half-torso of crispy, roasted pork hanging in the window; there’s also Chinese barbecue pork (cha siu), stewed chickens and stewed ducks. 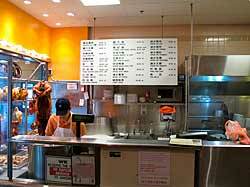 The trays below the hanging food contain various other dishes such as grilled octopus and various innards, for instance intestines and stomach. Although there is a quite extensive menu of Chinese food, we tend to come mainly for the congee (and the roast duck – see below). Congee is simply rice porridge to which a food of your choice has been added. It typically includes fresh ginger slivers and green onions. 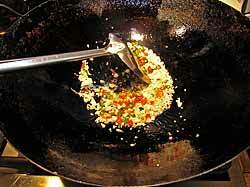 You can add soy sauce and chilli oil as desired. 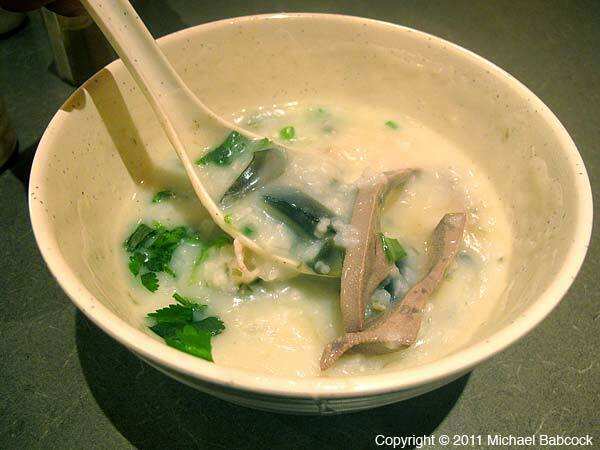 Gum Kuo offers a wide variety of options, listed under the menu category “Porridge.” Kasma nearly always gets the same thing: congee with pork liver, preserved egg and fish. She’ll occasionally get the pork kidney instead of the liver. The congee is served in a rather large bowl; for the two of us, we ask for two smaller bowls into which we serve the congee. Rest easy, you don’t need to have innards in your congee: you can get plain chicken, or pork, or beef or fish, if you prefer. 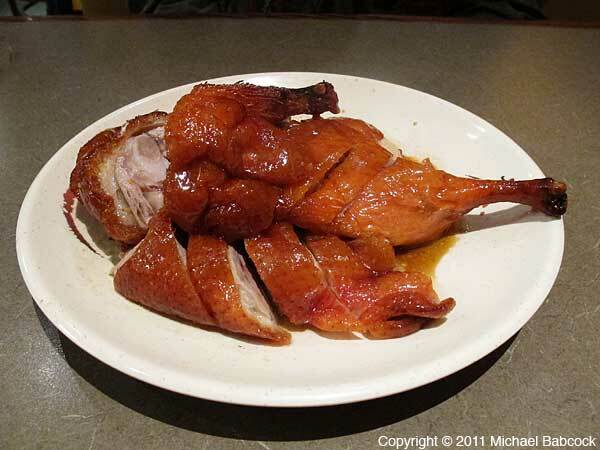 The other item that we almost always order is the roast duck. It’s on the menu under “Barbecue.”The roast duck here is excellent: crispy, tasty skin over moist and delicious meat. 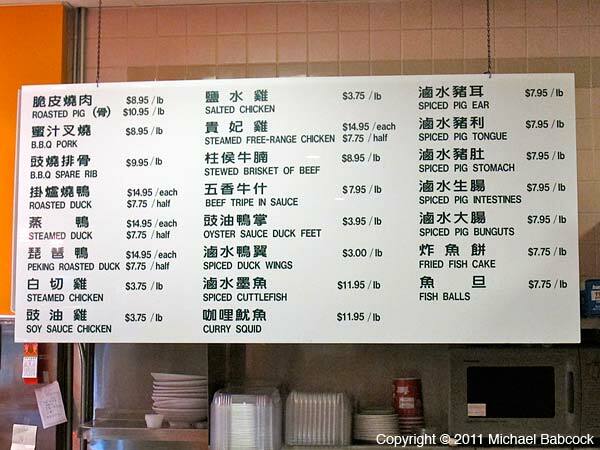 You can order just a plate of duck, but for a little extra you get an entire half-duck; if there’s any left, take it home for a snack or meal later. I’ll sometimes substitute a plate of roast pork for the duck. Chinese roast pork as served here has a crispy outer skin. There’s usually three layers to a piece: the crispy outer skin, a layer of fat and a layer of muscle meat. It is very tasty. In addition to the restaurant, Gum Kuo offers many items which can be taken home. Click on the picture to the right to read the sign more easily. 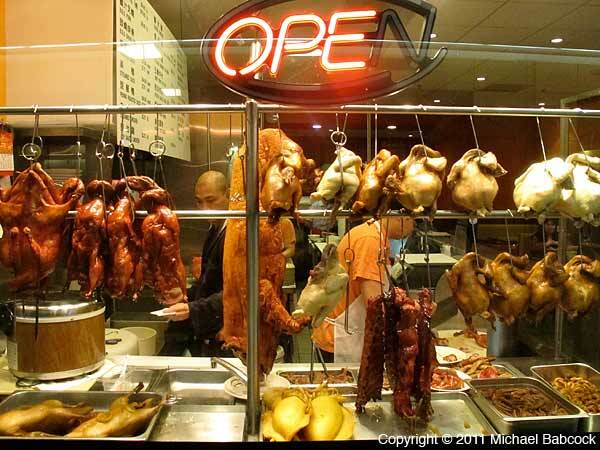 Roasted and steamed duck, steamed and salted chicken (they even offer a free-range option), and various spiced pig parts such as Spiced Pig Ears, Spiced Pig Tongue, Spiced Pic Stomach and Spiced Pig Intestines. 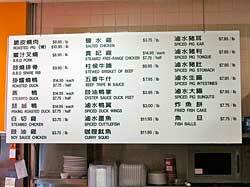 Of course, these items can be ordered as a restaurant dish as well. They also offer a more standard American breakfast – omelet or eggs with toast, that sort of thing. I’ve never been tempted though: the congee and the roast duck or pork are the reason why I come here. Next time you are in Oakland’s Chinatown, give Gum Kuo a try. You are currently browsing the Thai Food and Travel Blog blog archives for February, 2012.